Portadown set aside Danske Bank Premiership drama to enjoy safe passage past Donegal Celtic in the JBE League Cup second round by 6-1. 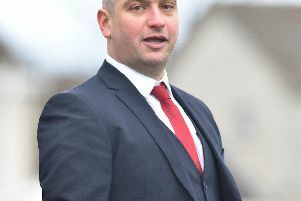 The Ports played host to the Belfast visitors having suffered three consecutive league defeats in a season disrupted by a 12-point deduction imposed via the Irish Football Association disciplinary committee. Niall Henderson celebrated his return to the side from suspension by breaking the deadlock on 17 minutes, with the midfielder capitalising on a defensive mix-up. Henderson had a minor part to play in the Ports’ second goal before the half-hour mark as his free-kick was cleared to Mikey Withers and Brendan Shannon diverted in the left-wing cross. A quickfire counter-attack utilised the pace of the impressive Eoin Kirwan and Sam Simpson as the latter attacked down the right wing then delayed his pass for the former to meet on the run and convert. A fourth arrived for the Ports after the break thanks to clever footwork by Withers that ended with a foul on the winger inside the box. Withers stepped up to tuck away the penalty kick. Celtic, however, carved out openings - with the pick falling to Declan Monaghan but he was unable to divert his header on target from an unmarked position. Thomas Conlon provided the away side managed by Portadown-born Stephen Hatfield with a reward on 64 minutes by scoring from inside the area. However, Portadown wrapped up the tie when Withers’ cross was headed in by Nathaniel Ferris and substitute Matthew Rooney drilled home number six. PORTADOWN: Chris McGaughey, Mark Carson, Adam Rodgers, Ken Oman, Ben Murdock, Brendan Shannon, Niall Henderson, Eoin Kirwan, Nathaniel Ferris, Sam Simpson, Mikey Withers. Subs: Conor Larkin, Aaron Haire, Matthew Parker (Rodgers, 54), Tim Mouncey (Oman, 51), Matthew Rooney (Kirwan, 70). DONEGAL CELTIC: Sean McIlhone, Karl Rossborough, Darren Munce, Artur Koput, Daniel Raynor, Ryan Dunlop, Ciaran Conway, Niall Derry, Declan Monaghan, Thomas Conlon, Kevin Hughes. Subs: Cormac Deery, Robbie McVarnock (Koput, 71), Maurice Curtis (Conway, 71), Pearce McAuley (Hughes, 76).